As things come in three's this post will be the last in the Spring Series *sad face* however its a goodie! 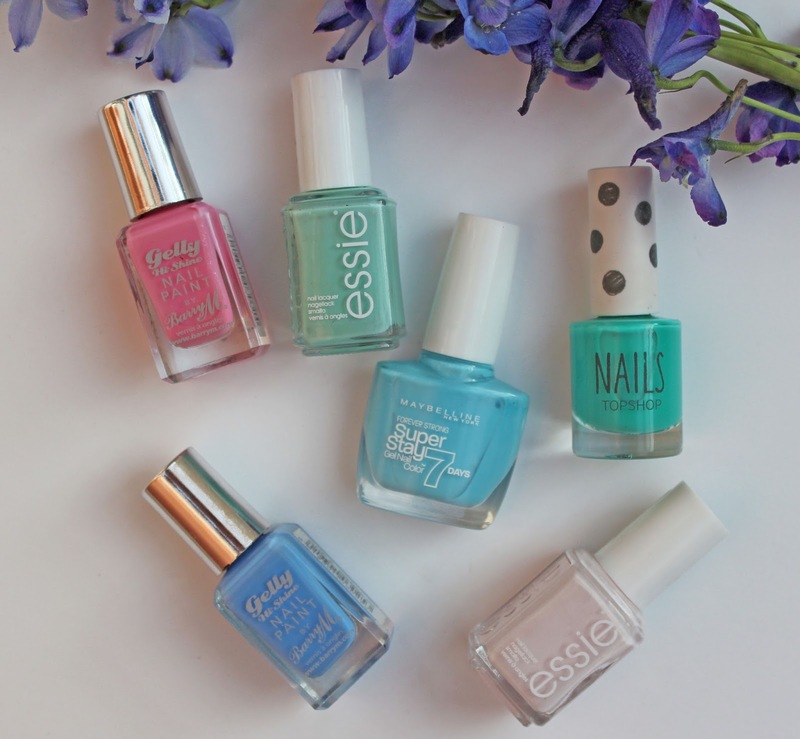 I have picked out some of my absolute favourites from my nail polish collection that are perfect for the Spring weather and I can't wait to start using these pretties again. I am a huge Essie fan so I'm sorry I couldn't narrow it down to one shade but I'm not that sorry because Mint Candy Apple and Fiji are both worthy of being in this post. I'm sure you've heard these two shades talked about loads in the past, they seem to have a bit of a cult status amongst beauty lovers. Fiji is a very pale pink that looks almost white, its a simple and chic shade. I normally like to wear silver rings with this to really set it off, it looks so nice and sophisticated daaaaarling! Mint Candy Apple was the shade a few years back when mint colours were just all over the place and I still love this just as much now. Green and blue nail colours are my favourites so its no surprise that I'm a fan of the one that started it all off really. Maybelline Forever Strong Super Stay Gel Nail Colour 7 Days in Uptown Blue is a vibrant yet pale blue shade which makes it very unique. It's so eye catching on the nails and last year I wore it all the time, I have a lot of time for a statement nail. Also, this polish doesn't chip for days and the brush is really wide so one swipe covers the whole nail cutting down manicure time! Speaking of statement nails Topshop Green Room is a very bright green/ blue shade which I lusted after for a long time before buying. I find the Topshop nail range to a be a bit hit and miss on the formula and this one does chip quickly compared to other formulas but I just could not resist this colour so I overlook the fact that it only looks good for a couple of days. Seriously though, the colour IS amazing isn't it? Totally worth it. Gelly Hi-Shine Nail Paint by Barry M in Blueberry and Dragon Fruit are bloody gorgeous. Blueberry is another blue shade (I did say I liked blues!) 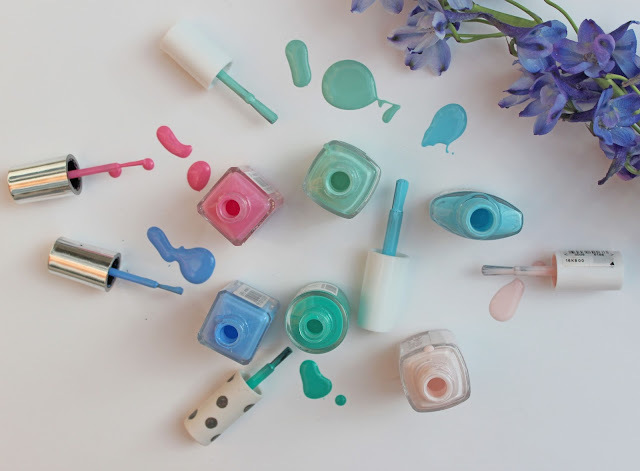 which is a pastel, cornflower blue colour so if you're looking for a blue that isn't as bold as the Maybelline one then this would be a good option. I don't tend to wear lots of bright pinks on my nails but I was really drawn to this one when browsing the Barry M stand and on closer inspection I noticed that it had a subtle silver sparkle though it which I thought was such a nice touch. It catches really nicely in the sunlight and I think on tanned skin this shade would look amazing. The formula of the Gelly range is one of my favourites as its super opaque and glossy.